I was surprised to learn that written invitations for neck-tie parties were not all that uncommon. When nineteenth century hangings went from being public spectacles to private affairs, the burden of inviting law enforcement officers, jurors and other public figures to the proceedings was the sheriff's responsibility. What better way to spread the word than sending out printed cards? These invitations were valued and any community leader not on the receiving end was insulted. For the most part, respectful fonts and paper were employed for the macabre task. Though most invitations were hand-written, a surprising number were engraved. Not only did the lawman use paper with a bright gold border, his tacky choice of words stirred a controversy that reached the White House. Somehow the invitation got into the hands of a journalist and newspapers across the country and abroad printed the story. President McKinley was so incensed by what he read he issued Smiley a thirty day stay of execution. 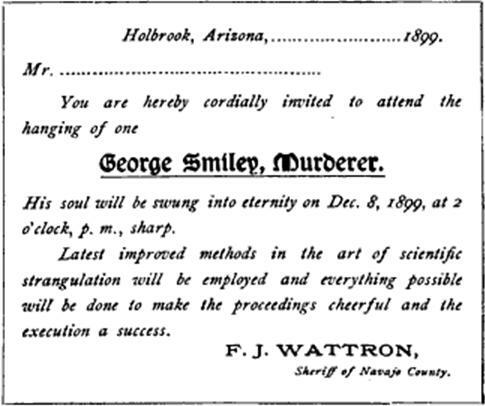 "The Sheriff of Navajo County, whose duty it is to execute the condemned and bring about the just expiation of an awful crime, has seen fit to publicly advertise and issue cards of invitation to the execution of the condemned, in unseemly and flippant language, and in terms which have brought reproach upon the good name of this Territory." Bending under the pressure Sheriff Wattron rewrote the invitation and was careful to include respectful black border. However, he showed his displeasure by mailing the invitations too late for the governor and other critics to attend. The second invitation was a vast improvement over the first, but somehow you get the feeling that it was written under protest. "With feelings of profound sorrow and regret, I hereby invite you to attend and witness the private, decent and humane execution of a human being; name, George Smiley, crime, murder." The sheriff ended the invitation by urging guests to "deport yourself in a respectful manner." So now you know why nobody laughed when Smiley died. "A truly entertaining must read"
"A creative plot and delightful characters"
"Good clean fun western romance"
"Thumbs up for mystery western"
"Wild west guns and grins"
I can't believe they sent out invitations! I recently saw a photo of a hanging and couldn't believe how many people came to those things. The picture I saw had hundreds of people. And it talked about how it was like an afternoon outing. I was shocked! Very interesting! I never knew about this before. Hi Rebecca, thank you for stopping by. I learned about how public hangings were public affairs when I visited Ft. Smith. People even brought their children to them. Shaking my head at that. It doesn't surprise me that invitations were issued, but the one that sheriff sent sure was tacky. Hi Vickie, I can't imagine people taking children to hangings, but I know they did. I can't imagine. A lynch mob here in Canon City dispatched a fella from a downtown telephone pole in 1888. Several people posed for the famous photo taken of the man swinging at First and Main. Even women. Interesting post, Margaret. Can you imagine if they had selfies back then? Hi Sharon, yes, I heard about Boston Commons, too. Fortunately, they did make hangings private and by invite only. That's why they sent invitations. Hi Debbie, it is incredible to think about people watching hangings, but then look at all the craziness going on today. Such an interesting post...thank you!